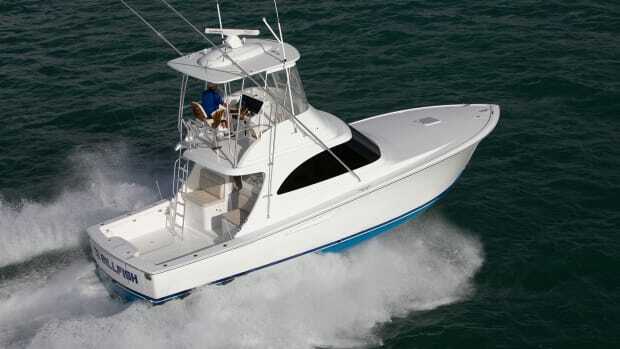 Our first look at the Viking 93 MY. 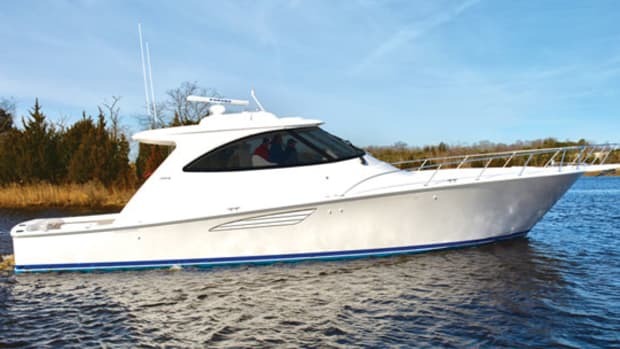 There’s a video of Viking’s newest offering, the 93 MY, cruising the briny, forking waterways of the Mullica River in New Jersey, in her first official sea trial. 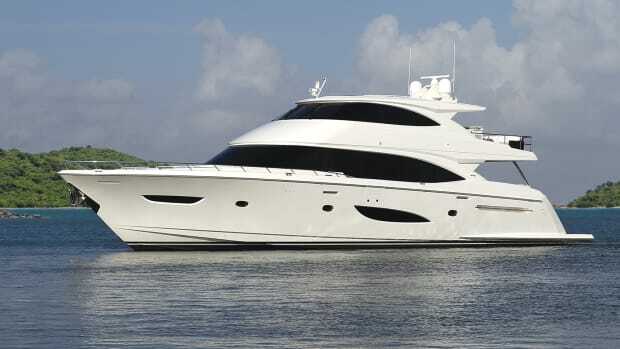 Tearing through the estuary, leaving Viking Yacht’s New Gretna headquarters and a trail of coppery foam in her wake, the 93 posted a top speed of 27-plus knots, and a cruise speed of 23 knots, all thanks to her twin 1,945-horsepower MTU 12V-2000 diesels. Looking as comfortable in The Boss’s backyard as she would on a mooring in Monaco, the 93 is nothing less than a behemoth. Flanking her on the test run was an 80C—a big, honking battlewagon—and she easily dwarfed her; no small feat. 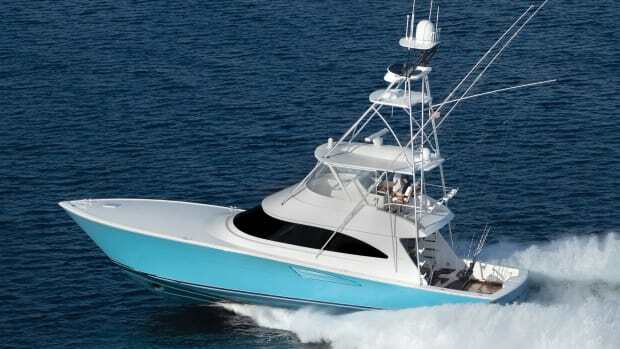 With an LOA of 93 feet and 5 inches, she is the largest offering in the boatbuilder’s history, its impressive lineup of sportfishermen very much included. But the 93 doesn’t give the impression of the builder being out of its depth, or being out-boxed in an entirely different class, either. 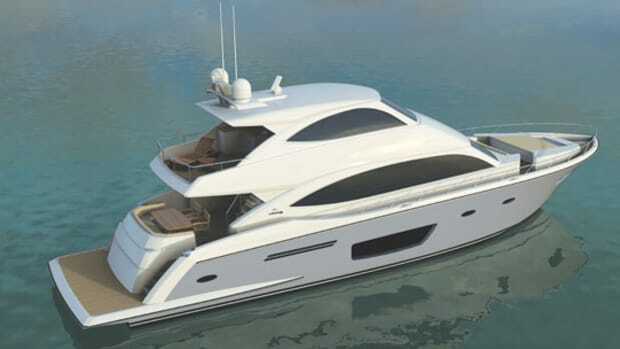 Remember, Viking had been producing angular motoryachts for decades before exiting the market in 2001. 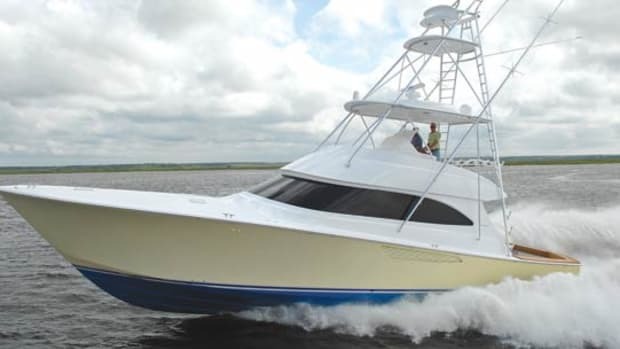 Sensing a void in the marketplace for large American-made motor-yachts, Viking pounced. 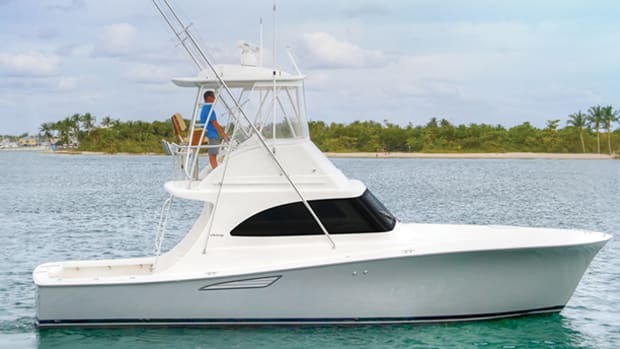 Reintroducing the motoryacht line starting with the 75 (in 2015), and the 82 Cockpit (in 2016), the 93 is both exemplar and the flagship model of this new line; if not a physical affirmation of the Healey family’s commitment to “building a better boat every day,” it proves Viking builds a better boat every year. And what a boat she is. 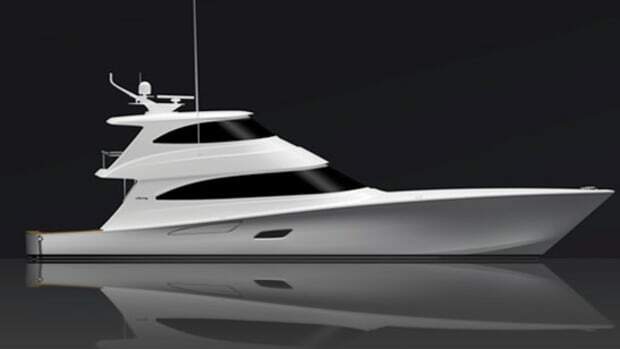 Featuring an almost unprecedented five-stateroom layout for a boat this size, the exterior profile has both sleek and timeless qualities with an inspiring sheer that is complemented by artfully shaped windows. 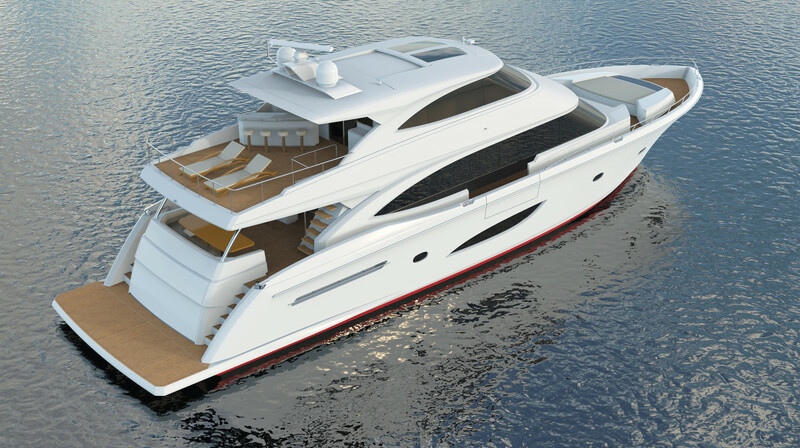 The build includes a skylounge in the enclosed flybridge, a salon on the main deck, and open-air aft decks on both of those levels. And that doesn’t even count the two additional crew’s quarters or the country kitchen all the way forward on the main deck. Maybe that’s why Healey said he thinks buyers looking in the 115- to 120-foot range will opt for the 93 instead. 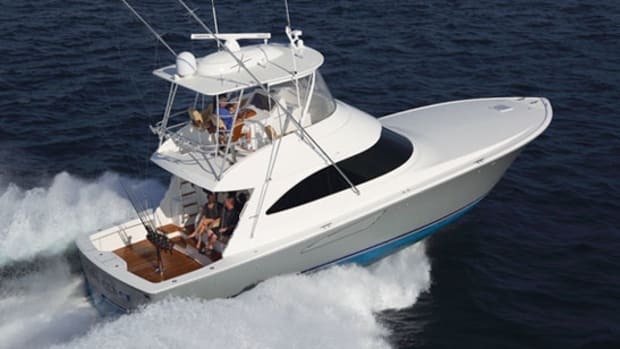 To that end, the sportfishing DNA the company has cultivated for more than 53 years made its way into the 93. Preliminary figures show that she has a range of about 450 nautical miles from 20 to 23 knots. At 12 knots, her range climbs to about 730 nautical miles, which will allow owners to achieve their more far-flung cruising goals. 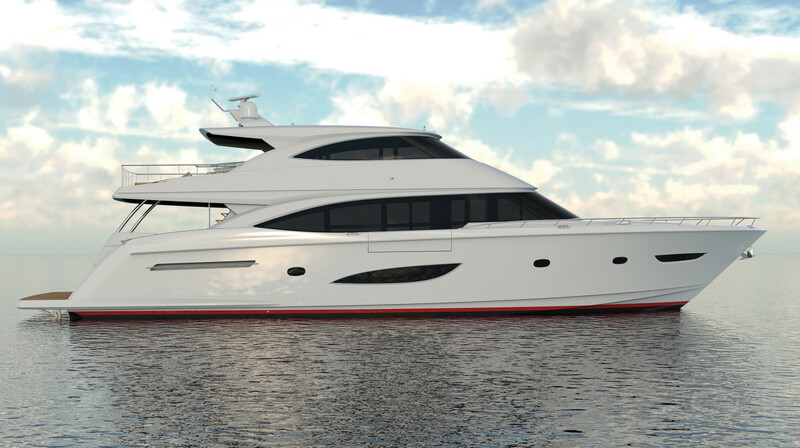 Look for the 93 to make her world debut at the 2017 Ft. Lauderdale International Boat Show.